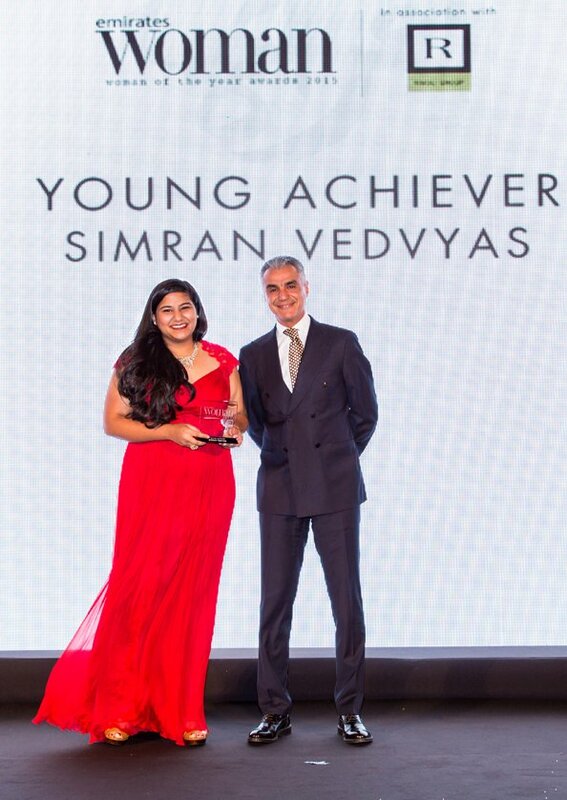 Sixteen year old Simran Vedvyas is a tour de force when it comes to challenging youth to adopt a more sustainable and peaceful lifestyle. Her impressive list of accomplishments belies her young age. A resident of Dubai, United Arab Emirates, Simran is the Founder and Chairperson of SynergY. Powered by Cosmo Foundation following the ideologies and principles of Earth Charter and Children of the Earth, SynergY is a group of young students from various institutions across United Arab Emirates and in India working together to advocate for more sustainable lifestyles relating to health, environment, and education. The organization provides grass-root opportunities for young people to participate in environmentally friendly initiatives like clean-up drives, mangrove rehabilitation, and tree-planting etc. Simran has received multiple awards and recognition for her work. 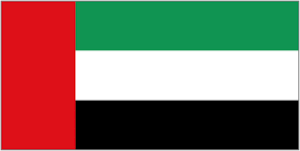 Those include awards from the Dubai Municipality for her Plant-for-the-Planet and Green Space-New Life campaigns, recognition from the Dubai Electricity and Water Authority (DEWA) for Earth Hour 2013 and 2014, and the Top Tetrapak Collector Award from Emirates Environmental Group. Recently presented with certificate of appreciation for the outstanding contribution and achievements, which made her a ‘role model for her generation’ by Dubai Municipality, furthermore, from 2007 to 2014, she has been named an honoree for the Clean up the World Awards. 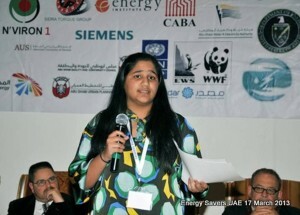 On a global level, Simran won the Samsung Engineering Best Environmental Presentation Award at the Global Youth for the Environment Forum in Seoul, South Korea in 2012. She was named Best Ambassador by TUNZA Eco Generation in 2013 and won the International Youth Day Contest held by the Youth Employment Network (YEN) in 2013. 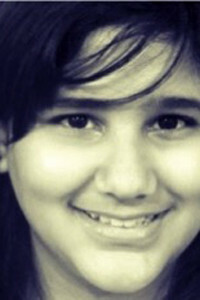 Most recently, Simran won the coveted 2013 Youth Environmental Conservation Award from the John Muir Association in the United States, International Eco Hero Award 2014 by Action for Nature USA, and Puruskar (at National Level in India) shortlisted as Best Student Paryavaran Mitra Leader for Change 2013. 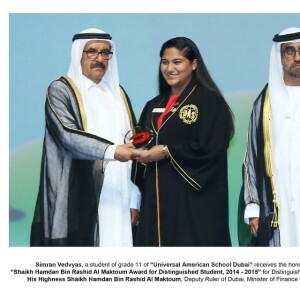 In addition, Simran has twice won both prestigious academic awards in the UAE, namely the Sheikh Hamdan Award for Distinguished Academic Performance and the Sharjah Educational Excellence Award. In 2012, she stands as the youngest girl from the Mid-East to carry the Olympic torch at the London Olympics 2012 in United Kingdom. Simran is connected across several global platforms as a representative of the Global Youth Board of Plant-for-the-Planet since 2013, the Regional Middle East Ambassador for TUNZA Eco Generation since 2012, the United Arab Emirates Chapter Leader for Children of the Earth, a Youth Activator for the Middle East and North Africa Hub of Earth Charter International, the Youth Ambassador A World at School, the Paryavaranmitra Leader for Change 2013, and the Climate Leader and UAE Ambassador for the United States’ former Vice President, Al Gore’s Climate Reality. As a speaker and youth advocating for environmental sustainability, Simran has attended over three-dozen International conferences, youth forums, and events traveling the globe to a similar number of countries proudly making presentations to help mobilize youth. The list includes Rio+20 (United Nations Conference on Sustainable Development 2012), UNFCCC Doha COP 18 Climate Change 2012, International Youth Forum 2012, 6th World Water Forum 2012, Global Youth for the Environment Forum 2012, and Eye on Earth Summit 2011, Annual Youth Assembly at United Nations Head Quarters USA 2013 and recently the First World Hindu Conference 2014; an event where she got the opportunity to be in the audience while His Holiness Dalai Lama spoke and she was able to shake hands which she takes as blessings to herself. Simran also recently spoke as the youth panelist at the United Nation’s First Arab States Regional South-South Development Expo 2014 held in Qatar. In her capacity as a ‘Star Youth’ from the UAE, Simran spent three days in Times Square in New York City, as her picture remained on the back-lit billboard captioned “Youth Future Champions” as part of the International Youth Day events in 2013! What is a 17 year old doing collecting shoes for people among other things she is supposed to be doing at her age? Quiet a bit actually! Simran Vedvyas in her calm voice and the maturity of someone beyond her years explains to me over the phone from Dubai, as to why she is doing what she is doing. With distinction in academics and awards like the ‘Heart of Gold’ for humanitarian commitment and the Princess Diana International award, this young achiever is the Founder and Chairperson of Synergy, a NGO youth group through which she advocates for sustainability, human rights, reduction of poverty and hunger, access to clean drinking water, education, healthy lives, and the provision of basic healthcare for all. Of the causes closest to her heart are health, peace, environment, youth empowerment, gender equality, and education for all. Her story spoke with Simran to know more about what keeps her motivated and inspired to adopt causes and work towards making a change. Over the years, Simran’s interest in sustainability has only grown. She has successfully led over 60 well planned and executed youth engagement campaigns to benefit the community and environment among which exceptionally outstanding is the planting of over 2,000 trees at various landfills in UAE, engaging over 300 students from various schools and institutions across UAE. Officially launched in 2012, through SynergY young students from various institutions across UAE work with the sole purpose to support various environment trepidations and societal uplift addressing focal areas relating to health, environment, education, and welfare. SynergyY works under the umbrella of Cosmo Foundation based out of India and does works in India and the UAE. Simran has successfully collected over 3,000 pair of shoes in less than a month. These were distributed in Kenya and Uganda in Africa through US-aided AMPATH. Simran’s father had met a woman named Lu at an Abott Diabetes care conference who was collecting shoes for diabetic patients in Africa. Her father told her about Lu’s efforts. Unfortunately, two days after the conference on her way back home, Lu passed away as she was suffering from type 2 diabetes. Simran had never met Lu but decided to take up her project and start the collection of shoes. Simran started by seeking support from the social media, when the Gulf News picked up the story, they shared her email id too. Simran to her surprise found her inbox flooded with offers from people in UAE who wanted to contribute. Very quickly the shoes were collected and sent to Africa. Of the many awards and recognition she has received for her work, the most special one has been the moment when she was chosen to carry the Olympic Flame at the London Olympics in 2012. Well if a 17 year old can visualise world peace, then we do have hope for the future. Simran’s understanding of people and problems around her is deep and reflective of her commitment to be the change maker. Five years down the line she aims to study medicine and surgical sciences. “I have always had a strong interest in health sciences and I would like to go on to study that. Ultimately, I would like to incorporate the ideals behind a sustainable world in medicine. Medicine is being revolutionised everyday and sustainability is a crucial part of that now and I want to be a part of that change,” she says with absolute clarity and emphasis. She is very excited about the Emirates Young Achiever’s award which she has been nominated for and is hopeful to garner public support and goodwill for it to emerge as a winner.